CROSBY  J. Pat Parsons, Chairman and CEO of CommunityBank of Texas and Mark Mulloy, CEO and Vice Chairman of Crosby State Bank, announced today that CBFH, Inc. of Beaumont, the holding company for CommunityBank of Texas, has signed a definitive agreement to acquire and merge with Crosby Bancshares of Crosby, Texas, pending shareholder and regulatory approvals. Crosby Bancshares is the holding company and 100% owner of Crosby State Bank, a state chartered, independent community bank headquartered in Crosby, Texas with assets in excess of $354 million. The bank has been in business since 1913, employs 102 people and currently has eight branches that include two in Crosby, two in Baytown and single branches in Northshore, Humble and the Sheldon and Memorial areas of Houston. According to Parsons, once the merger is approved, plans call for the current management team of Crosby State Bank to remain actively engaged in leading the charge for the Harris County branches. He added that Mark Mulloy will be appointed to the CommunityBank of Texas Board of Directors. Parsons has guided the course of CommunityBank of Texas since the bank officially opened August 1, 2007, after acquiring County Bank and its seven branches in Newton and Orange Counties. Since then the bank has experienced remarkable growth and significantly expanded its branch network to include 14 branches throughout Southeast Texas. Additional locations are currently under construction in Beaumont, including the banks headquarters on Delaware at Dowlen Road and a new branch on Phelan Boulevard. Another new branch was opened earlier this month in Lumberton and regulatory approval was recently received for a new location in Woodville. CommunityBank of Texas is the only locally owned, independent bank serving the entire Southeast Texas region. The bank currently has assets approaching $640 million, employs 154 and operates 14 branches throughout the region. CommunityBank of Texas provides a broad line of consumer and commercial banking products and services that emphasize local decision making. HIGHLANDS  The Highlands-Lynchburg Chamber held their annual Awards Luncheon on Thursday, Sept. 11, just before the Hurricane came into town. These presitious awards are for service to the community, and include firefighters, law enforcement officers, business/organization, and the most important, the Terry Davis Award, which remembers the person whose name on the award is synonymous with selfless dedication and commitment to the community betterment. 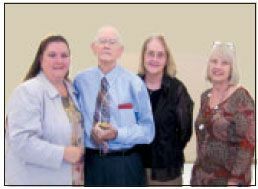 The Terry Davis Award this year went to James Brazzil, the 91 year old retired co-publisher and founder of the Highlands Star newspaper, and through his work with the newspaper, Rotary, church and writing helped to shape the town into one of the finest places to live in Texas. Other awards went to Outstanding Volunteer Firefighter Ryan Hotchkiss, accepted by Lt. Daniel Spears; Outstanding Deputy Constable Blake Bogie, presented by Constable Ken Jones; Outstanding Sheriffs Deputy John Hernandez, presented by Lt. Francis Bradley; and Outstanding Organization Highlands Rotary Club, presented by Chamber President Jessica Woods to last years president Charlie Ward and this years president Patricia Scott. The Terry Davis Memorial Award started in 1983 as the Chambers businessman of the year, and the first award went to Dr. W. L. Herndon. In 1984, it was renamed the Terry Davis Award, and the first recipient was M. L. Bishop. It is presented by the Chamber each year, to the person who exhibits the great qualities of an examplary model for us all. Like Terry Davis, someone who is always there to help with whatever project is at hand, someone who has helped with Fundraisers, benefits, and can be called an outstanding community service person. One that has helped Highlands become what it is today. 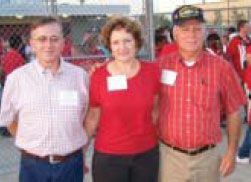 Terry Davis was a well known Highlander and prominent businessman who was one of the founding members of the Highlands Chamber of Commerce, and chaired the first fundraiser, which was the Carson and Barnes Circus. He was very active in the community, serving as a volunteer deputy for the Sheriffs department, and volunteer fireman for Highlands VFD. He helped the clean-up efforts around the community from Hurricane Alicia. He died on Sept. 3, 1983 due to burns he sustained while burning storm debris at his home. Jessica Woods also announced that the 52nd Annual Highlands Jamboree would be held on Saturday, Oct. 4. Events to be included in the Jamboree are a Walk/Run and Bike Ride, for the benefit of the United Way Campaign; the Parade at 10 am; a Childrens Pageant for any age up to 5th grade; and Jamboree events at the Highlands Elementary School from 11am to 4pm. These will include Kids Games, Crafts Booths, Food, Karaoke, and a Silent and Live Auction, benefitting the Chamber. The Cub Scouts Troop 107 will be present serving BBQ. HOUSTON — A huge Category 2 Hurricane Ike changed everyones life in Southeast Texas starting last Friday, and continuing through most of this week. The massive storm, almost 500 miles wide, originally aimed at the coastal area around Freeport, but eventually changed its path and hit Galveston directly, causing severe flooding and structural damage to West Beach, Seawall, the Strand area, East Beach, and Bolivar Peninsula to the east. The storm had winds as high as 110 mph, and surge tides up to 20 tall. Amazingly, unlike the Great Hurricane of 1900 that destroyed Galveston, which was at that time the largest and most thriving city in Texas, Ike did not cause a lot of deaths. In 1900, estimates of the dead were between 6000 and 12,000. To date, Ike has been attributed with only about 26 deaths in Texas, and about 61 total along its path through other states. Part of this minimal loss of life is due to the fact that warnings were issued for days prior to its landfall around 2 a.m. on Saturday morning, Sept. 13. A major mandatory evacuation of all of Galveston was ordered on Wednesday, and of low lying areas of Harris County by the end of the week. Eight zip code areas in Harris County were told they had to leave. Most school districts, businesses, and other institutions decided to be safe, and closed either Thursday noon, or all day Friday, so that people could prepare, or leave the area. Because the evacuation was spread over several days, and other lessons about traffic control and fuel supplies had been learned from previous Hurricanes Katrina and Rita, the mass evacuation did not cause gridlock traffic jams. It is estimated that almost one million people left their homes, in Galveston, Houston and Harris County, and other areas that were on the dirty side of the hurricane, in other words Beaumont, Orange and other counties to the east of Galveston Bay. The Hurricane hit early in the morning of Saturday, and Houston had relatively quiet weather up until the actual coming ashore of the storm. Most of the wind and rain associated with this type of storm occured during the night, and homeowners awoke Saturday morning to discover their neighborhoods floods in the southern parts of the county, but only wind damage to trees, building, signs, fences and other similar structures in northern Harris County and surrounding areas. However, some notable exceptions included two structures in the city, the Brennans New Orleans style restaurant downtown, which burned completely, and some fire damage to the Magic Island restaurant, an unusual structure and magic venue on the Southwest Freeway near Greenway Plaza. Firemen were dispatched to fight these fires, although high winds and heavy rain made the response less than ideal. Galveston did not fare well. Most of the central city was inundated with flood waters, as much as 8 high in streets of the Strand. Water breached the Seawall, destroying part of it and all the souvenir shops and restaurants built on piers out over the Gulf. Fires destroyed one major boat house in the waterfront area downtown, and many homes in the affluent western end of the island. Hundreds of homes on Bolivar Peninsula were completely washed away, with barely any evidence that they had ever been there. Some loss of life was projected both on Bolivar and Galveston, because as many as 15,000 people had refused to heed the mandatory evacuation, and they may have been killed by the force or waters of the storm. However, as of press time, only 9 deaths have been attributed to the storm in Texas. Since the storm has passed, media reports and photos have shown the complete devastation on the islands, but reporters say it is hard to appreciate unless you are on scene. Authorities have kept the public from returning, and it is not known when Galveston might begin to recover or repopulate as a resort city. It is obvious that a massive rebuilding program will be necessary. To this end, representatives of the state government, including Governor Rick Perry, and the federal government, including Homeland Security Secretary Michael Chertoff, FEMA head David Paulson, and President Bush, have given the area superficial tours and promises of quick relief. However, in actuality aide has been slow to arrive, and there is some evidence that the effort is disorganized. Mayor White and HC Judge Emmett have shown frustration at the lack of results, and expressed it in their news conferences. Congressman Nick Lampson told the Star-Courier that poor performance would bring an investigation by Congressional authorities, and other local congressmen have echoed this sentiment. Promises from the leadership team have included 10,000 power company workers from CenterPoint Energy, and 7500 National Guard troops from the state. CenterPoint said that they had extra workers coming from states far away, including California, Colorado, Ohio, and Pennsylvania. In reality, recovery has been slow, the public and community leaders complained. Rain hit the Houston area on Saturday, after the hurricane had passed to the north. This rainstorm was a separate storm, coming from the West. It dropped several inches of water, which contributed to extensive flooding seen throughout the area on Saturday and Sunday. Many roads were closed, including I-45, I-10, and feeder roads on most of the Freeways. Authorities have said this contributed to the slow delivery of some FEMA supplies. In addition, bayous could be seen overflowing their banks, including White Oak Bayou, Greens Bayou, and Halls Bayou. The latter had extensive flooding for a while in the area where the bayou crosses Jensen Drive and US59. Due to the severity of the storms, and flooding and power problems, the city closed both airports on Saturday and Sunday to all commercial and private flights. Limited service was resumed on Monday. Power outages were the greatest problem for most Houstonians. At one point, CenterPoint reported that almost 2 million of their customers were without power, and that it would be weeks to restore full service. Likewise, Entergy reported 97% of their customers without power, and since they serve rural areas, including the Woodlands, they thought it might take 4 weeks to restore everyone to full power. This lack of power has contributed to other problems for most residents: no gasoline, because stations dont have power to pump gas, and no ice or refrigeration and therefore only a small amount of food that can be stored to eat. Related to this is the fact that most food stores were closed for lack of power or personnel on Saturday and Sunday and Monday. FEMA and State authorities had promised prior to the hurricane that they would preposition supplies of food, water, and gasoline so that an orderly return to normal would be possible. Part of the plan is to set up P.O.D.s, or Points Of Distribution, throughout the city, county, and Galveston area, to serve the population until full services can return. These P.O.D.s are being manned by volunteers and federal employees. Red Cross, Salvation Army, church and civic volunteers, and TSA (Transportation Security Agency) have been involved. In the East Harris County area, several P.O.D. locations are now active: In Highlands, at the San Jacinto Community Center; in Baytown, at West Town Mall, 4100 Decker Drive; Baytown Courthouse Annex, 701 West Baker; and in Channelview, Fonteno Courthouse Annex, 14350 Wallisville. Provisions that are being handed out include 2 bags of ice, 2 gallons of water, and a box of MRE (Meals Ready to Eat) per car or family. These PODs are currently set up, but may change in the next few days, so check. By Monday, about 19 locations were actively distributing food and water. In addition to the official PODs, there are a number of shelters that were established the first night for evacuees or those who otherwise found themselves unable to defend against the oncoming storm. Many of these were in churches, schools, or community centers throught the region. The Red Cross reported that Friday night they had established 75 shelters, serving about 9500 persons. One of the first shelters was set up at Crosby High School Friday night. Many municipalities have instituted curfews, in response to an expected increase in crime because of the areas with no power. The city of Houston had a curfew from midnight to 6am every night, according to Police Chief Harold Hurtt. On Monday, however, he reported that actual crime and arrests were down from the normally expected amount. Almost all school districts and college districts suspended classes, most from last Friday until the end of last week. This included Goose Creek, Huffman, Crosby, Dayton and Barbers Hill as wellas San Jacinto College and Lee College.. As of presstime, most districts were planning to reopen, with different schedules announced. Most districts rescheduled football games that had been planned for last week, too. As of Monday about 87,000 of 2.1 million customers had power restored by CenterPoint, according to the company. 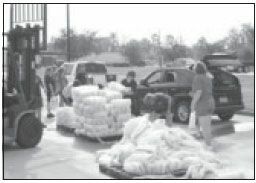 FEMA reported that a steady convoy of trucks with supplies was entering the Reliant Stadium staging area, where they were then redeployed to the PODs for the public to pick up supplies. HIGHLANDS, CROSBY, HUFFMAN — These communities began to dig out from Ike before it struck with preparations; locally, it was a storm of falling trees and wind sheer; thus far local and private effort has provided the most relief. 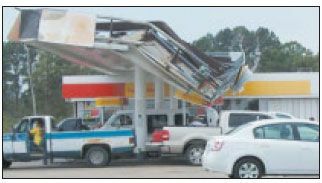 Most emergency services believed that the county or state would supply them with fuel to keep services rolling in the event of such a disaster. Highlands and Crosby had to rely on alternative means. Most express some exasperation with federal, state and county relief efforts being less quick than expected. The night of the hurricane, Precinct 3 Constables patrolled in high water vehicles from Baytown to Channelview from Highlands to Huffman under the direction of Sgt. Lee. Deputy Ricky Larkin took charge of the rescue boats. That law enforcement department worked traffic and crowd control throughout the areas during relief efforts. In Crosby, H.C. Emergency Services #5 and Crosby Volunteer Fire Dept. ran 62 distress calls throughout the first two days after the windy invader. The director of that Crosby ambulance service, Christy Graves, applied for and was granted a Texas Form I.C. 213 for disaster relief, that brought a F.E.M.A. Point Of Distribution (P.O.D.) to Crosby. During that time, Crosby Fire and ambulance services not only handled an increased volume of calls but also volunteered to man the P.O.D. The school and the local emergency service district sheltered over 600 people, 60 dogs and 3 cats at the high school during the storm with an emergency medical triage inside. Mike Joseph, Superintendent of Crosby I.S.D., not only administrated the disbursement of the schools services including the Custodial Department but personally volunteered for emergency relief efforts throughout the district. The Crosby I.S.D. Board held two emergency meetings to determine that school would begin today, Sept. 25 and football would be played this same day. However the other team, the Hurricanes, was unable to play. The food stored by the district was spoiled by the storm. Much of the diesel used to run emergency calls was provided by Crosby I.S.D. once the fire and ambulances exhausted their supplies. Residents cleared trees from atop houses and telephone lines after two days in the Nelson Subdivision. Crosby Volunteer Fire Dept. made over 100 trees down calls in Newport alone following the storm. Newport remained without power through Tuesday. In Highlands, Harris County Precinct 2 Commissioner Garcia urged a Point of Distribution for San Jacinto Community Center with the Harris County Office of Emergency Management. But the County did not arrive until after 2 days. The Transportation Safety Agency had volunteers on hand to dispense ice, meals ready to eat (m.r.e.) and water before Federal Emergency Management (F.E.M.A.) trucks arrived. However, getting those three relief items at the same time was spotty at best with water being the only commodity available at times. Highlands trash removal began on Sept. 16 after much of the road blockage was removed. The Highlands Volunteer Fire Department began preparations before Ike was named to keep emergency services flowing. Highlands emergency services, fire and ambulance ran over 100 calls over that weekend. Chief Little credits H.C. Office of Emergency Management with enabling his department to receive natural gas for the generator that kept his crews operating after the storm. Ryan Hoskis, a resident of Highlands, donated two 55 gallon drums to the department to keep it running. BAMACo a private cleanup company from Florida supplied Highlands with donated gasoline and diesel. Equistar gave H.V.F.D. 20 gallons of diesel following a trip over to Channelview. The dept. had to cut trees from their egress to get to calls. The fire dept. is postponing their barbecue until sometime in October. Highlands V.F.D. never lost their radio repeaters, Harris County Dispatch did however get knocked out of broadcast ability for some time. Dispatch was then handled by cell phones. Ike swatted Huffman with downed trees power lines, telephone interruption. The local high school had the roof torn off of the new press box, roof damage and broken windows at the high school and middle school. According to Dr. Douglas Killian, (as he was out cleaning up the playground at Ben Bowen Middle School with the Maintenance crew and the Operations Manager of Huffman I.S.D. on Sept. 19) roof tops of the dug outs at the baseball and soccer fields were blown away. The profusion of downed trees and power lines in Huffman made estimates of power restoration difficult but much of Huffman got power on schedule, Tuesday. One of the back up generators at Copeland Elementary developed a gas leak and went off but crews repaired that the second day and the school avoided food spoilage. A generator at the high school sustained water damage from flooding after window breakage. Maintenance repaired that generator also. No I.C. 213 was made for Huffman. The story of Ike will be told and retold from many viewpoints. From outages and property damage to heroism and helping hands, Ikes memory will not quickly fade. We will do well to remember how so many did so much for the Crosby community. Crosby ISD opened the high school as an emergency shelter from Friday at 2:00 pm to Saturday afternoon providing protection from the hurricane for over 600 people. With the help of constables and many volunteers, the district provided food, water and safety to families and pets. A special thanks to Dr. Marley Morris, Crosby H. S. principal, who spearheaded the districts efforts at the high school relief shelter. On, Sept. 17, FEMA utilized the high school grounds for a Point of Distribution (POD) where thousands from the community were able to receive ice, water and meals ready to eat (MREs) for several days. The National Guard, who orchestrated the FEMA efforts, noted that they had never seen a community help out as much as they did in Crosby. The Guard members were impressed by the number of people volunteering, how much they helped and the hospitality they experienced from everyone. Examples of service abound throughout the district. A Texas-size Thank you! goes out to the districts athletes who cleared the debris from about 30 local homes. Other notes of appreciation include all those students, staff, parents and community members who helped with the POD for several days. Students from JROTC, Student Council, Drama and other organizations all contributed their time and effort to help those in need. Helping out with running forklifts for the POD included Ernie Roder and Jared Barrett. A special note of appreciation for two outstanding people whose leadership, help and heart knew no bounds during and after the storm: Superintendent Mike Joseph and Director Maintenance & Facilities, Chuck Murray. Their countless hours of devotion provided the community at large with guidance, encouragement and motivation. Though Crosby has no mayor or city council, these two men led the charge for both relief and recovery efforts. Mike Joseph and Chuck Murrays crusade of help and hope will always be remembered by the Crosby community and those of us who call them friend, neighbor and colleague. It is about 10:30 a. m. Monday morning, Sept. 15, as I begin to write this. Just got off the telephone with my Houston based son Dave. We spent about 30 minutes on the phone discussing the hurricane aftermath facing those of you in the Houston-Galveston area, compliments of Ike. Our thoughts and prayers go out to each and every one of you impacted by the water and wind. The remnants of Ike passed through here last evening with some wind gusts of up to 35 or 40 mph but no rain. We could use the rain, too. We have only had one significant rain fall here in the past month or so and everything is drying up. I heard this morning that Chicago, already waterlogged, got about twelve more inches Saturday and Sunday. Wish the good Lord would move that just a bit east. After I finished my conversation with Dave I went over to the microwave and warmed up my coffee. During the few seconds that took I thought, Dave cant do that just now and it may be several days before he can. He had just told me what electricity he could muster at home he was dedicating to the refrigerator and little else. I have never been through a hurricane so I really dont know what it is like. While I have seen reports, photos, newspaper and TV stories, none of that really brings one to a real sense of what it is like to go through one. My closest call to being in one occurred years ago when I was on a work assignment in Clear Lake, Tex. A hurricane was moving around in the gulf and was first predicted to hit land around Corpus Christi or Victoria, then it was Galveston and finally it came ashore in Louisiana. I was driving a car down I-45 when it was blowing hard in the gulf near Galveston. Debris was flying through the air and I was having difficulty keeping the car on the road. I was glad to get settled in and also relieved when it didnt come ashore. In addition to Dave, daughter Denise and spouse, Linda, have been through them. Linda and Denise were vacationing in Florida several years. They had been to Disney World, stopped at Lake City on the way home and rode one out there. Later they were visiting with Dave while he was living in Houston and Alicia hit. They both said that was by far the worst of the two. For now, however, the results of Ike still must be dealt with by you, your neighbors, businessmen and government officials. So far it appears things are being handled much better there than with Katrina in La. a few years back. May that be so and continue to be so for the sake of all of you. Thanks to Hurricane IKE, I have started a batch of blackberry wine from the berries we picked earlier in the year. Tedious work running six large bags of berries through a sieve to separate the juice from the seeds not to mention the mess. Started the process without a shirt and looked gut shot from the squirting of the juice. Got the Mrs. home today, as she has been working 12-hour days as a first responder since the hurricane passed. Guess you could say I too am a first responder. Had to respond to all the food in the fridge and freezer and clean it with bleach and water. With the power off for four days, it reminded me of growing up without the benefit of air conditioning and all. Two nights were hot and the other two were comfortable sleeping weather. Never slept with a sweat rag before, but did on the second night. A caller to the electric company said she has a legally blind son and they needed their lights on. If you think about it, a person in that condition can possibly see shadows and outlines of objects. Come to think about it, I got beat at golf by a legally blind person. A woman from Kansas City called to see if power was on at her daughters apartment complex. The woman said they got tornados spawned from IKE and they could smell seawater in the air. Do you believe that? Piddling around in the garage one afternoon, I heard the neighbors new dog bark as if something was up, so I went for a look-see. The neighbor had a plastic slide, which was on the ground upside down, and the German Shepherd was circling the slide with caution. Grabbed my Sharp Shooter shovel and went into their backyard. Sure enough, there was a cottonmouth water moccasin underneath. Had to have FOUR DOG put down recently, one of the hardest things I have ever done. Took a while to get up the will power to have it done. FOUR was like one of my boys and my best friend. No more dogs for me even though they are great company and do not talk back. * Crosby ISD Board of Trustees who had the foresight to support the acquisition of Connect-Ed, our phone communication system. With this resource, our student dismissal process, shelter information, recovery efforts at the high school, and back to school information were shared timely and efficiently with our community. * Crosby ISD Staff, led by Maintenance Director Chuck Murray, that provided over 600 community members, 80 dogs, and 3 cats, with a safe place to stay at Crosby High School during Ike. * Christy Graves and the entire ESD unit for providing medical care at the shelter and helping every day in the distribution of food, ice, and MREs at Crosby High School. Christy was the driving force behind having the National Guard come to CHS and we are lucky to have such a caring, community minded person here. * Coach Flanigan and the athletes who spent 4 days going throughout the community cleaning yards and bringing smiles to peoples faces. * Grasslands, Brad Walker Grass Farms, and Sunbelt Rentals for lending equipment at the high school so all the supplies could be unloaded. Special thanks to Ernest Roder and Jarrod Barrett who drove the fork lifts four straight days unloading semis. * Members of the Crosby Volunteer Fire Department, our JROTC, Student Council, and various other students who helped distribute items at CHS. We had students, staff, and community members who volunteered many hours during the four days the National Guard was set up at CHS. It was an amazing experience – the National Guard and trucks showed up Wednesday morning at the high school with food, water, and MREs and members of the community stopped to help. The person in charge of the National Guard, Lieutenant Copeland, could not get over the warmth, help, and kindness shown by everyone. * Lisa, Lindy, and Amy Ellender and Ms. Arroyo, who worked 26 hours straight at the shelter volunteering in the infirmary. The community of Crosby is a very special place – while Ike took our electricity and trees, he could not take our resilience and our neighborly spirit that permeated the community. Crosby ISD is going to welcome our students back to class with open arms on Thursday. If students are hungry, we will feed them. If some need and want to take a shower, we will take care of them. And then we will get back to providing a quality education for our 5,000 students. CROSBY  All the excitement over the general election this coming November 4 will be locally highlighted by the Crosby I.S.D. School Board of Trustees election as two positions are challenged and a former President is running unopposed. Five positions came up for election this time and three candidates registered. Gerald Blankenship, a former submariner, now President of the local American Legion Post, will stand unopposed for Position 7, to be vacated by Earl Boykin. His name will not appear on the ballot as Harris County says it would cost more to enter his name. Blankenship indicates he wants to balance the school budget in a couple of years but acknowledges that this will be difficult as the state is currently requiring No Child Left Behind but not funding it. Locke states that his primary appeal for local voters is that he is not tied to any local entities. These three all agree that school programs are being slashed due to budget constraints. They believe there are ways to cut budgets that will not jeopardies childrens education. They state they are for fiscal responsibility of tax dollars. They summarize their intentions as ACT (Accountability, Change and Transparency for the districts future. Related to accountability, they intend to create a high quality, effective learning environment. They hope to ensure accountability while improving the level of cooperation between the board, teachers, the community, the state and federal government. The first thing we need to do is get out from under that 40 year old federal desegregation mandate, says Blankenship. In their quest for accountability they intend to report to the community on a consistent basis students learning progress, how funds are spent and the overall fiscal health of the district. To bring about change, they agree to balance the decision making process by allowing open dialog between the school board, teachers and the other aspects of the community with the understanding that best decisions are made through community involvement. They intend to focus on the importance of academics and be advocates for students, parents and teachers. Their plan for transparency involves supporting an open and transparent decision making process including informed research, analysis, public input and reasoned discussions. They intend to implement the most participatory and transparent budget-setting process to determine school board spending policies. These seem lofty goals considering the state of public schools today. In countless articles throughout the state, increasing costs of operations and capital projects would seem to make balanced budgets an impossibility. Meanwhile state representatives are saying schools have all the money they ever need. 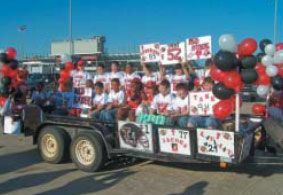 Last Saturdays 2nd Annual Crosby Youth Football parade left with lots of enthusiasm from the parking lot of the high school as cheerleaders and players waived, threw candy and displayed posters showing their enthusiasm. The official season started at noon that day and will continue for 11 more weeks. The intent is to develop skills and enthusiasm for the game of football in this area. Home play will be held behind Arlans market in the new fields from Harris County Precinct 4. Above are the Red Rayders saluting for coach Mike. As usual, Im having trouble focusing. Its the last day of the week that I can devote completely to my writing, and yet the gravity of that does little to motivate me. I should be taking full advantage of this day to myself, but instead I am resisting the temptations of the internet, television, and a nap. This is no easy feat  all are well within my reach. But I figure that writing to you, while not technically something that will advance my career as an author, is more productive than any of the alternatives. At least its writing, right? eight different windows on my computer screen right now. Hows that for short attention span? I remember when we took World History together in our junior year of high school, and our teacher told us that unlike most teachers, she would never yell at us for doing off-task things in class. She said that if we were smart enough to be in her honors class, then she trusted us to multi-task. Wed only get in trouble if we didnt do our homework or werent able to answer a question that she asked us. At the time, I thought that was extremely cool and forward-thinking of her. She understood the way we worked! But now I cant help wondering if our ability to multi-task is really a blessing in disguise. For me, doing more than one thing at a time usually means Im just not doing any of those things very well. I think Id rather be a master of one trade than a jack of them all. But can I re-train myself to focus on a single task and finish it before I go on to the next? Well, I wrote this letter to you in one sitting. I dont think it means that Im cured, but I think its a sign that the diagnosis is correct and the medicine may be starting to work.